As part of Lankford & Battle Insurance Agency’s community program, a new charity campaign is now active, in support of underprivileged children in Madison County, Alabama. Understanding the challenges of the kids who HEALS works with, Lankford & Battle decided to join efforts with the organization to provide the children who come to HEALS for an annual well-child checkup with new athletic shoes. 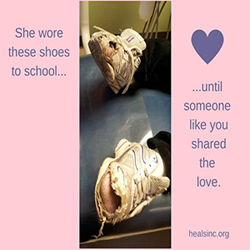 Well-fitting shoes is something we don’t often think about, but for these children a new pair can make a world of a difference. To achieve the agency’s goal of $500, their network of customers, business partners, friends, staff and family are being invited to actively participate by not only contributing financially, but also by helping spread the word to others. Lankford & Battle Insurance Agency continues to employ its own resources to ensure the success of their community program. The current campaign is being promoted through the agency’s social media channels, email communications, as well as through their monthly magazine, delivered to thousands of households in Alabama. In fact, Our Hometown magazine reserves a full page to feature this worthy cause, including all of its details. The electronic Flipbook version of the current issue can be accessed here: http://www.lankfordbattleinsurance.com/Our-Hometown-Magazine_39. The donations page at https://www.crowdrise.com/heels-for-heals--a-step-in-the-right-direction/fundraiser/lankfordbattle will be kept active until the end of June, where donors can contribute. The agency will acknowledge in their monthly magazine all of those who get involved in the campaign. Lankford & Battle Insurance Agency will continue to work with individuals and nonprofits in the area to identify new worthy opportunities to support the community. Through the agency’s website, any members of the community can also submit information on known families or persons who could use some help – http://www.lankfordbattleinsurance.com/Add-A-Community-Cause_53. Entries are diligently submitted for review, and the elected worthy causes are properly contacted by a representative of Lankford & Battle’s Community Program. More information regarding past and current campaigns supported by Lankford & Battle Insurance Agency can be found at http://www.lankfordbattleinsurance.com/community-cause. Lankford & Battle Insurance Agency’s mission is to provide the best insurance and financial services in the industry. Their priority is to protect the current assets their customers have worked so hard for, and to help them invest so they can retire with the right amount of money. Lankford & Battle’s success is measured by customer satisfaction and the value brought to their lives. The capable agents at Lankford & Battle can be easily reached at 256-890-0070.